Dublin Protest, originally uploaded by Mototoske. Did you know that 11.5 trillion dollars worldwide are held by the rich, offshore and untaxed? If that was taxed at a low 30% it would net 255 billion dollars. Among the better know tax dodgers are charity-mongers Bono and Bob Geldof who have non-dom status. The U2 guys didn't even want to pay the low rate of tax of Ireland which is practically an offshore banking centre itself. Info from economist John Christiansen on the Mark Thomas podcast. In other news the Met police are predicting mass unrest both organised and unorganised this year as a result of the economic crisis. I tend to agree, levels of anger against the banks and in fact the system itself are rising. 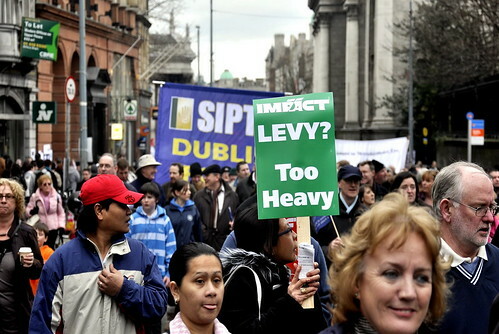 The 100-200 thousand on the streets of Dublin are a sign for the near future in the UK.